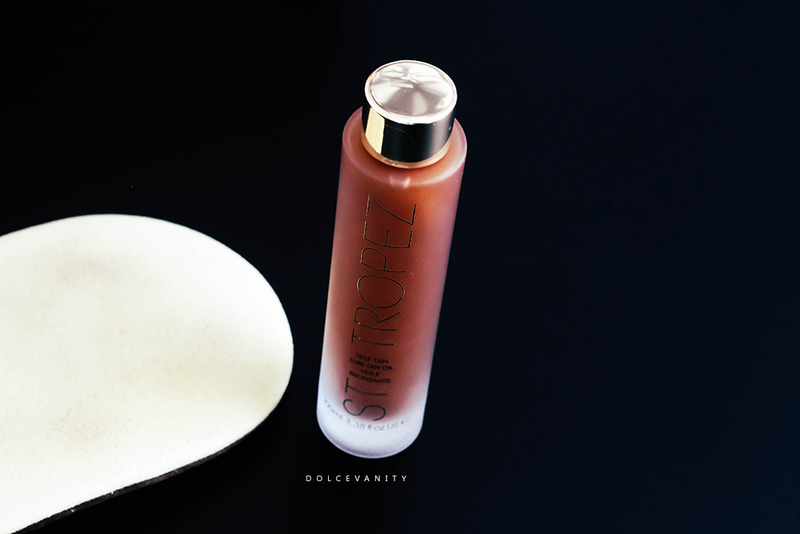 While I was looking for cruelty free tanning brands, I read that St Tropez is one of them. I've tried lotions, I've tried mousse, so now it's only right I try a dry oil -right? This is how St Tropez describe the product : "Our most luxurious tan yet, for the ultimate natural, golden glow that lasts for days. This Brazilian inspired dry oil with added hydration, creates healthy looking skin, with a glamorous shimmer on application. 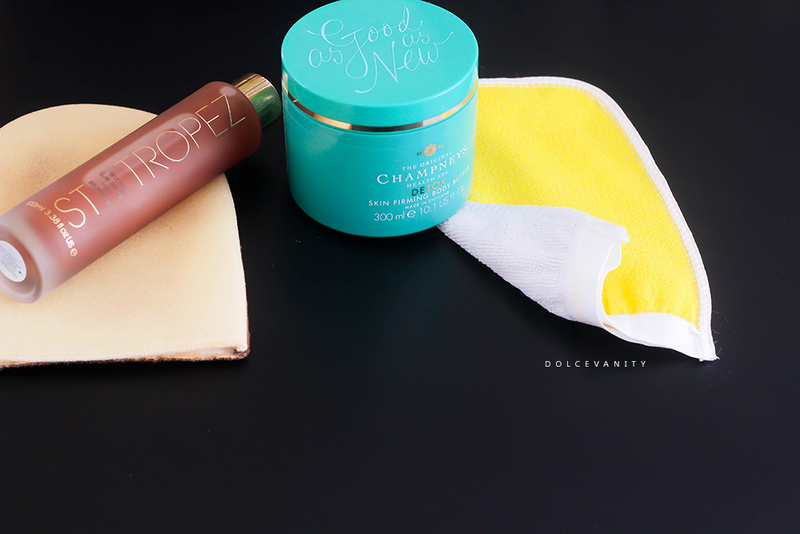 For best results, apply using our Tan Applicator Mitt." Ingredients : Aqua (Water), Glycerin, Dihydroxyacetone, PEG-40 hydrogenated castor oil, PPG-15 Stearyl ether, BIS-PEG-15 methyl ether dimethicone, Mica, Bertholletia excelsa (Brazil Nut) seed oil, Citrus grandis (Grapefruit) peel oil, Cymbopogon flexuosus (Lemongrass) oil, Citrus aurantium amara (Bitter orange) flower oil, Dimethyl isosorbide, Phenoxyethanol, Potassium sorbate, Limonene, Citral, Caramel, Linalool, Triethoxycaprylylsilane, Geraniol, Tin oxide, Farnesol, Citronellol, CI 77491 (Iron oxides), CI 77891 (Titanium dioxide). Before all application, I moisturise with a cream on the typical drier areas, such as the feet, ankles, elbows and hands. The bottle has a stopper with a hole, which gives more control of the oil, instead of an open mouth just pouring out. Giving it a few shakes onto the mitt and I've got enough for application from my ankles upwards. I honestly couldn't see too much of a colour indicator but I am browner than others who typically tan but what can be that indication is the traces of gold shimmer as you apply this but you need to be in direct light. The way I've learnt to do my feet is once I've finished one leg, I'll run whatever product is left over that legs foot. The same application goes for the hands, making a claw shape in the hands so the tan doesn't just sit in the lines. While applying I was impressed to smell this, there was none of that tanning scent that many of us can't stand and is that high indicator of self tanning products, there's an almost fresh/floral scent but what I noticed as it began to develop some hours later, that tanning smell kicked in. Yup! It's alive. Application is pretty simple and quick while the trick to do my back, turn the mitt back to front (the side you're using is now resting on the backside of your hands instead of palm side) was easier than I thought. You can get dressed once it's dried, I found it dried on me within 10 - 15 minutes if that. The skin didn't feel dry as I would've expected it too, it's not WOW moisturising but it's bearable for me. I applied the tan around 2pm and washed it off gone 9pm, St Tropez say to wait 4 - 8 hours before washing the tan off. I washed it off and I could still smell that tan smell and I always when washing off a tan use my exfoliating mitt and shower gel, just to give a clean removal and get rid of that tanning smell. There was a change in colour on my back in comparison to my bum as I didn't tan there -Unfortunately my before photo of the tan was deleted with other images I needed - it gave a nice brown shade but of course the next day was going to tell more. During the night, there was no tanning marks on my bed and it would be easy to tell as the sheets are white but I could still smell that biscuit stench. I repeated last night's shower routine and there was more tan coming off with the suds not much if honest and my tan was still there, on the legs it looked as if there was an orange tinge. But a couple days into my tan my skin started to constantly feel itchy, on my back, legs and arms and this would be before and after shower and exfoliating, I'm not sure if it's down to the tan but I've changed nothing in my routine besides this and if it is this, that's making me itch, then no bueno. So I'm currently on the fence with the product.